Today’s global payment system fails to address the currently siloed payments networks lacking efficient inter-connectivity to serve the needs of today’s customers. A few pain points in the subsisting network – limited transparency, low speed, and high cost- stem from the absence of a single, global payments network. These all points result in moving businesses and consumers away from banks towards Fintech providers. Nonetheless, the latter is much adequate and efficient in meeting consumers’ needs. What opportunities does Ripple for Banks offer? RippleNet intends to deliver a single, frictionless platform for cross-border payments. It’s is a single, global network of banks used to conduct payments using its distributed financial technology; providing a real-time messaging clearing and settlement of transactions. 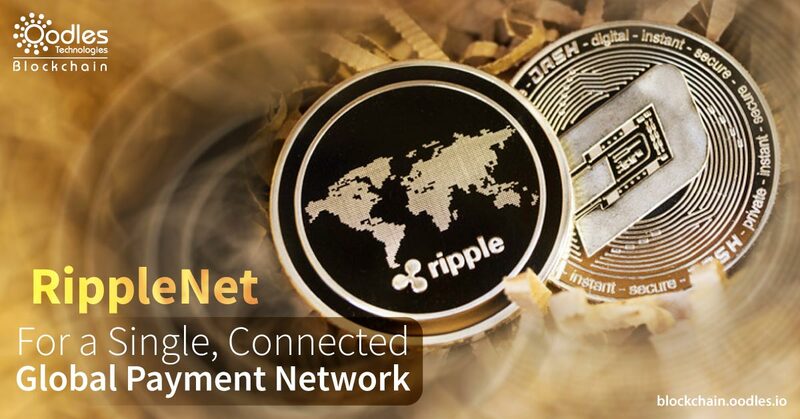 RippleNet forms of a decentralized network based on the term between Ripple and its network participants. Both utilize the same technology and stick to a defined set of payments standards and rules. By adopting the technology of RippleNet, banks get robust connectivity, standardized technology, and necessary data attachments with each transaction. It’s the Ripple’s distributed financial technology that outruns today’s complex infrastructure by lowering costs, expediting processing, and providing end-to-end visibility in payment timing, fees, and delivery. RippleNet’s ecosystem of participants is categorized into two groups; network users (corporates, consumers, and others) and network members (payment providers and banks). Banks leveraging RippleNet can drive acquisition and enhance their servicing to current customers. They can process payments for corporates and consumers. Also, some could process payments for other banks as well as provide them with liquidity. Payment Providers leveraging RippleNet can enable supply liquidity and increase payout reach for banks to expand their payment volumes. Platform businesses fall into this category. They can send disbursements of high volume and minimum value to a worldwide network of merchants, suppliers, and employees. Corporate treasury departments can enable sending large disbursements using RippleNet across their worldwide supply chain to achieve improved capital efficiency, control, and visibility. Banks and Payments Providers, which only want to send payments, rather than processing them, could leverage RippleNet. In turn, they can overcome the high costs and limitations of correspondent banking. Consumers can use RippleNet’s single, global payment network to send cross-border payments, through their payment provider or bank for a real-time and cost-efficient option. Today’s customers want the ability to send global low-value payments in real time and on demand- not only to banking networks but also to developing financial networks (such as mobile wallets). The conventional system and today’s infrastructure push banks to execute payments in batch, which results in lengthy settlement times, poor customer experience, and high processing costs. Using Ripple for Banks can help connect those siloed networks via an open, neutral protocol called Interledger Protocol (ILP). Subsequently, it would bring efficiency to financial settlement time by allowing real-time settlements along with ensuring transaction certainty and eliminating settlement risk. RippleNet also provides data-rich messaging between transacting participants- providing a real-time payment experience to end-users. Ripple’s software called xCurrent allows banks to stand out by providing them with innovative cross-border payment services at low-cost settlements. xCurrent, designed to match the requirements of banks, fits perfectly within their existing issues, information security framework, and compliance. RippleNet’s standardized technology, xCurrent, is also the first global real-time settlement system (RTGS). It enables banks to message, clear and settle their transactions with improved transparency, increased speed, and efficiency across RippleNet’s global network of payment providers and banks. The solution is developed around ILP. As mentioned earlier, Interledger Protocol (ILP), that connects siloed networks via an open, neutral protocol, enables interoperation between payment networks and different ledgers. xCurrent offers an end-to-end, cryptographically secure payment process equipped with transaction immutability and information layoffs. xCurrent, designed to serve banks’ demands, complies with their risk, policy and compliance requirements. Due to software architecture, it also reduces business disruptions and integration overheads.